Returning to Epcot at Walt Disney World for another tip on photographing in busy tourist attractions. This one can be tough if you are traveling with children but not impossible. Even as busy as a Disney themepark can be, if you wait a bit, an opportunity will present itself. The first photo of the Hall of Prayer for Good Harvest in the China pavilion, I took at 6:27PM. People were still going in and out and walking about the area. 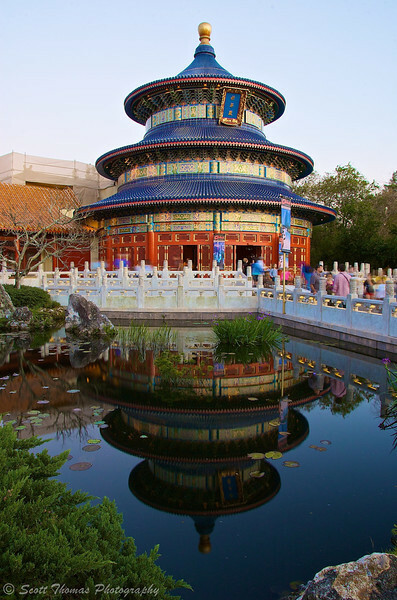 People are seen entering the Hall of Prayer for Good Harvest in the China pavilion at Epcot. Nikon D70/18-200VR, 1s, f/16, ISO 200, EV 0, 18mm focal length, tripod. I really wanted a people free photo so I waited. It only took 20 minutes and the Cast Members had closed the doors to the attraction. People would still walk up to the building but not very often. I was able to capture the scene a few times without anyone entering or leaving the frame. A quiet Hall of Prayer for Good Harvest in the China pavilion at Epcot, Walt Disney World, Orlando, Florida. Nikon D70/18-200VR, 30s, f/18, ISO 200, EV 0, 18mm focal length, tripod. The added benefit of waiting was the start of Blue Hour which added color to the sky. Next time, take a few added minutes to see if where you are photographing clears of people, even at Walt Disney World. 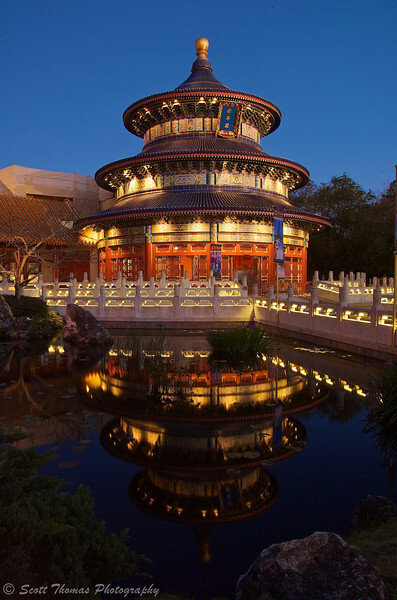 This entry was posted in Photography and tagged 18-200mm vr, blue hour, china, epcot, florida, hall of prayer for good harvest, lighting, lights, long exposure, nikon D70, orlando, pond, reflection, tripod, water. Bookmark the permalink. Keeping people out of a shot can definitely be tricky sometimes. It also helps to keep the camera planted to your face, with your finger on the shutter. Sometimes, you’ll only have half a second before someone walks into the frame. But you’ll also get the people who will stop because they see you trying to take a picture.